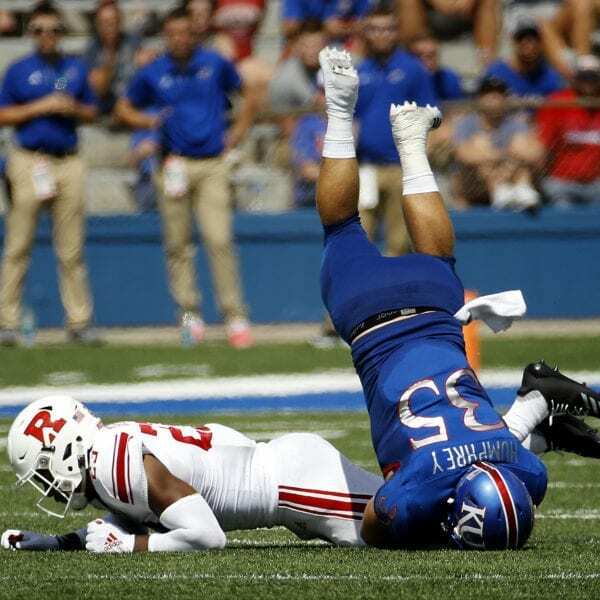 LAWRENCE, Kan. (AP) — Six takeaways, including two pick-6s, and an explosive running game carried Kansas to a 55-14 blowout over Rutgers on Saturday, marking the Jayhawks’ first back-to-back wins over FBS opponents since 2009. Turnovers plagued the Scarlet Knights from the start, as Torneden jumped in front of a Sitkowski pass on just Rutgers’ second drive and returned it 39 yards for the game’s first touchdown. Torneden was there again the next time out, recovering a fumble by Jonathan Hilliman that set up a field goal. Early in the second quarter, Lee picked off a Sitkowski pass on the sideline and scored to open a 24-7 lead, weaving his way laterally across the field 31 yards to the end zone in an effort that looked more reminiscent of a punt-return score. 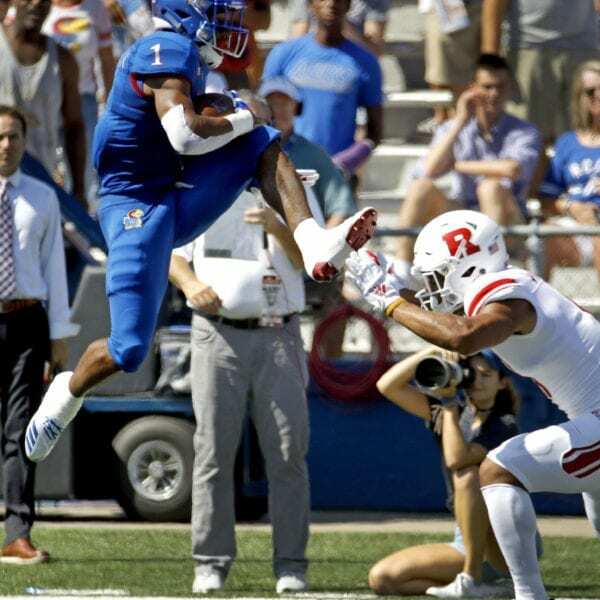 True freshman Pooka Williams was the star on offense, the leader of a group of several backs for Kansas that rushed for 400 yards and scored four times. Finishing with 158 yards — including a 52-yard touchdown run — Williams now has 283 yards and three touchdowns in his first two college games. Both Miles Kendrick and Peyton Bender saw time at quarterback for Kansas, but Kendrick carved out a much larger role then in weeks prior thanks to some strong play. After seeing consistent work in the first half, Kendrick started the third quarter and never saw the bench again. 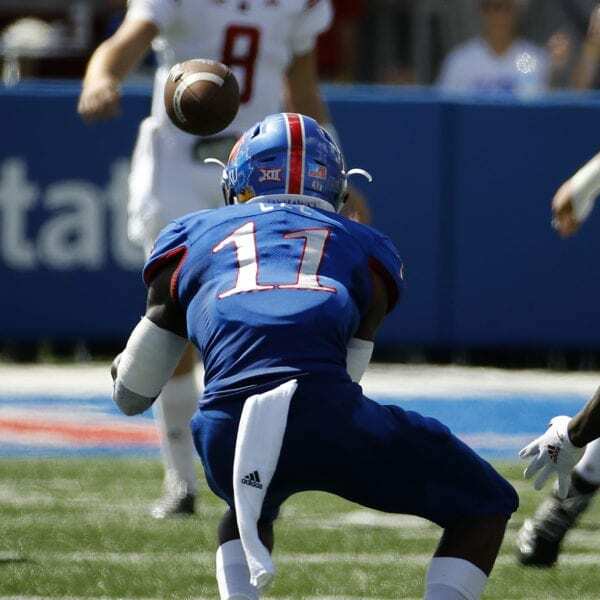 Kendrick was responsible for the Jayhawks’ lone score through the air, a goal-line fade to Jeremiah Booker, who lost his shoe while landing in the corner of the end zone. Kendrick also ran for an 8-yard score in the third. 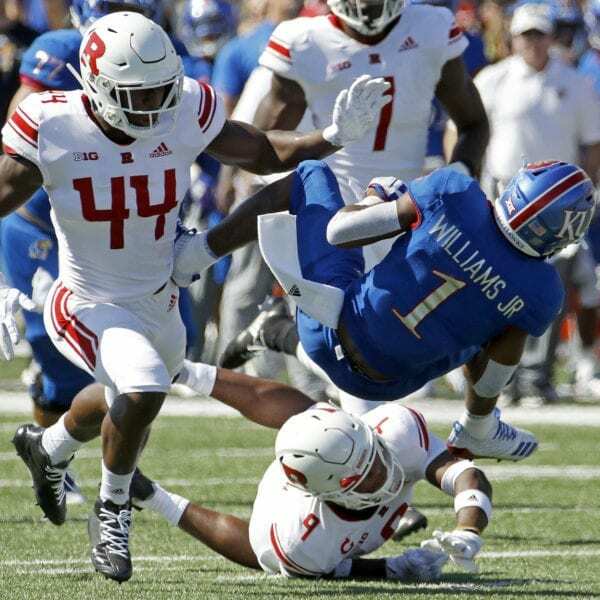 Special teams was one of few bright spots for Rutgers, as Deonte Roberts blocked a Kansas field goal try in the first quarter and took it 64 yards for the touchdown. The Scarlet Knights blocked another field goal later in the quarter, but didn’t get any points out of it. Sitkowski finished the game with just 47 yards and three interceptions before being replaced by Gio Rescigno in the third quarter. Raheem Blackshear led Rutgers in rushing with 102 yards, and Hilliman added a score on the ground as well. 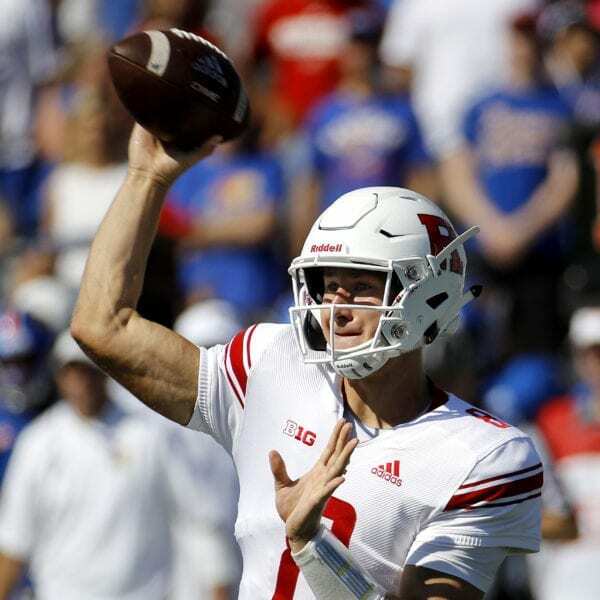 Sitkowski’s status for this weekend was in question all week after taking a vicious hit against Ohio State last week, but he started for Rutgers. 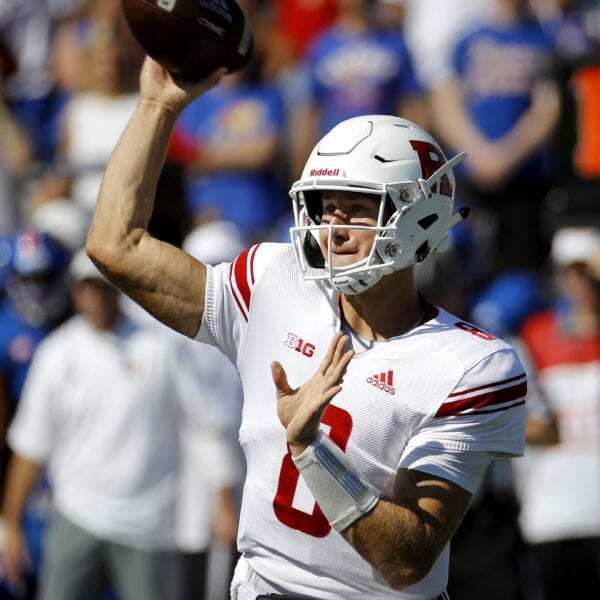 His lackluster performance soon resulted in the call for Rescigno, though, and the senior captain responded, throwing for 30 more yards than Sitkowski on seven fewer attempts. 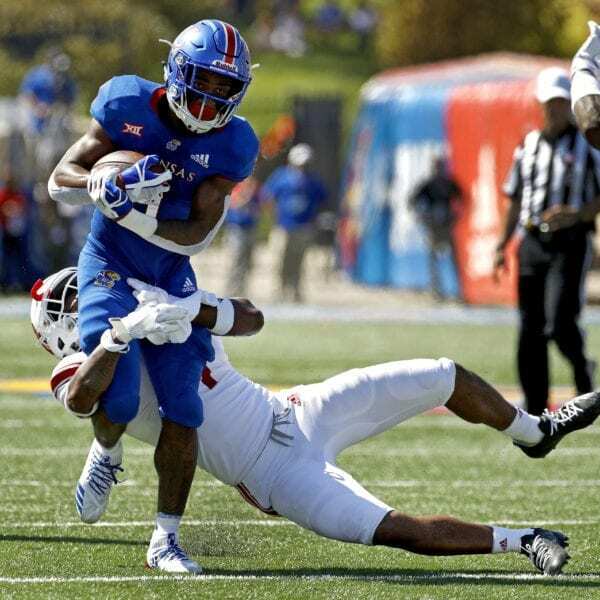 The Jayhawks finished with six takeaways, putting them at 13 on the year after forcing six last weekend against Central Michigan. They only had nine throughout the entire 2017 season. Former Kansas quarterback Todd Reesing was inducted into the Ring of Honor after the first quarter, his name placed between former teammates Aqib Talib and Chris Harris Jr. In his four years in Lawrence, Reesing threw for over 11,000 yards and 90 touchdowns, and led the Jayhawks to wins in both the 2008 Orange Bowl and the 2009 Insight Bowl. Kansas: Is 2-1 for the first time since 2014. Optimism is running high among the Jayhawk faithful, as the team rolls into Big 12 play with a winning record. Rutgers: Drops what many thought was a good chance to add a win before facing the throes of the Big 10 schedule. Ash has claimed making a bowl game is his goal in Year 3; games like these need to be won in order to achieve that. Kansas: Opens Big 12 play against Baylor on Saturday. 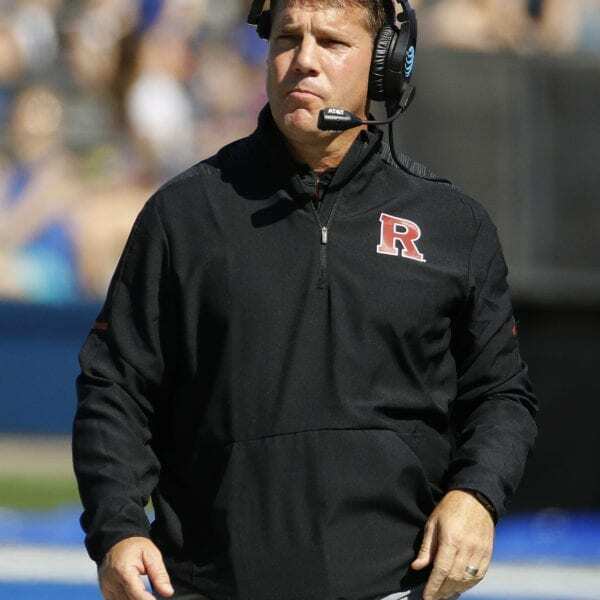 Rutgers: Hosts Buffalo on Saturday, its final nonconference game of the season. 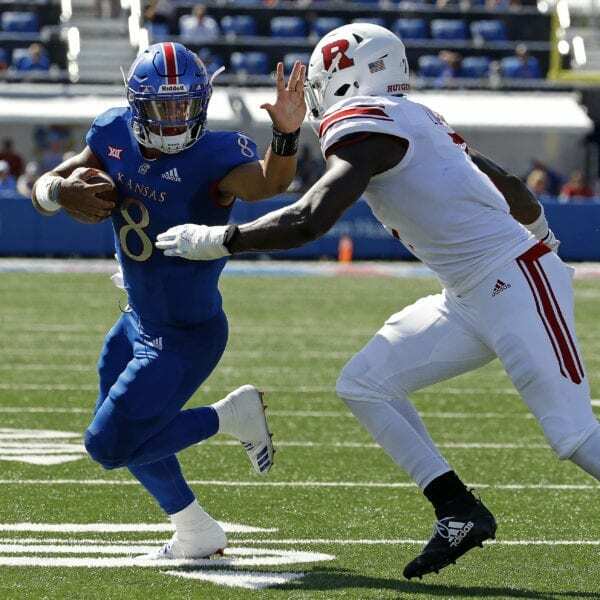 Be the first to comment on "Takeaways, Run Game Lead Kansas To 55-14 Blowout Of Rutgers"